When it comes to getting outdoors with your friends and family to have a good time, many people chose to play “war” with paintball guns or airsoft guns. Both are equally as fun, but they are vastly different from one another in several ways. Both guns also hurt when your opponent is hit with either the paintball or the airsoft pellets. While they both hurt, they are still great ways to have fun with your pals without sitting inside all day doing nothing. If you are trying to decide which would be a better option for your afternoon or summertime fun, there are a few things you should note about both options. Here is more information for you. What are Air Soft Guns? Typical airsoft guns are made to resemble commonly used weapons. Often they are made from a plastic or a biodegradable resin that makes them lightweight and easy to carry around. They have a low muzzle energy as well, giving the pellets less penetrative powers. Airsoft guns are a great way to have fun, and the toys are made to resemble actual guns that are used in various conditions. Often, military weaponry is simulated for these toy guns. Since airsoft guns are made of plastic, they cannot be changed into actual guns. Airsoft guns shoot something called airsoft pellets, which are the required ammo. Though they come in different sizes, you should check for caliber sizes on your pellets before purchasing them for your gun. Commonly called a paintball marker, a paintball gun is similar to an airsoft gun, though the mechanics are a bit different. These guns are shot through expanding gas like carbon dioxide or another form of compressed air. With this, the gun propels paintballs through the stock. Originally, these guns were used in forestry to mark various trees or even wandering cattle. Commercial paintball guns have a lower muzzle velocity, and it can cause damage to soft tissues if unprotected. This is why people wear gear when playing. Paintball guns require a certain type of ammo, called paintballs, that will be discussed later. However, before you purchase ammo, you should always check for caliber sizes to ensure you are purchasing the right size for your specific gun. What Kind of Gear Should be Worn to Play? If you are playing with airsoft guns, no gear is necessary. However, some people choose to wear things like long-sleeved shirts or sunglasses to protect their arms and eyes. Airsoft guns rarely cause any damage to the skin other than minor bruising. Paintball gunplay should be done with a protective mask that covers the eyes, ears, and face. This is because paintballs are shot from the gun at a high velocity, and it can cause major damage to the soft tissues of the face if left unprotected. This question is going to depend entirely upon who you play with, how close you are being shot at, and what kind of clothing you are wearing. This means that determining which one hurts the worst is going to be different for everyone that tries both airsoft and paintball. When you look at it in general terms, however, it can be said that paintball hurts more than an airsoft. Why? Well, paintball is a game that requires a high-velocity muzzle to shoot the tiny balls of colored paint. When hit with this high-velocity item, it can leave bruises. However, airsoft can also leave bruises, especially if you are hit with an airsoft pellet from a close distance. Though the muzzle velocity is much lower, these pellets can still leave welts and bruises on the skin, if hit with close contact. What are the Types of Ammo Used? Airsoft guns use something called airsoft pellets. These tiny pellets are only about 6mm and weigh only about 0.12 grams total. They are small, and they are typically made of plastic. They are vastly different than BBs, which are shot from a BB gun. Be sure to check your gun for caliber size before purchasing ammo, since they often come in different sizes. Paintball guns require a different, and messier type of ammo. Paintballs, as they are called, are small gelatin spheres that are filled with a paint substance that includes things like polyethylene glycol and dye. Paintballs come in different calibers that will depend on the type of gun that you have. You should check your gun before purchasing ammo. Airsoft is luckily a game that can be played anywhere. As long as you have space to run, you can have an airsoft war with your friends. To make it more interesting, you can find a place with several obstacles to challenge yourself and your friends with hiding and climbing. 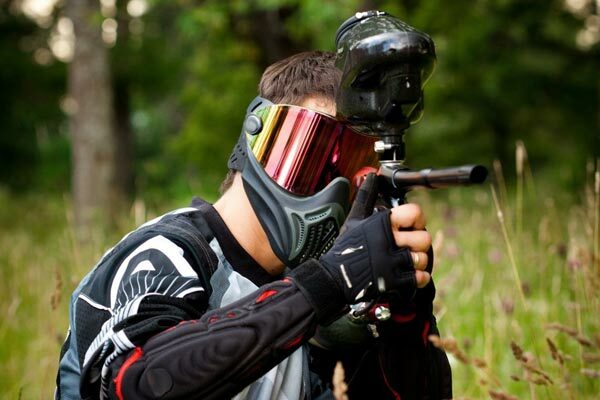 Paintball can be played in wide open areas, as long as there is plenty of room for shooting without being at a close distance. However, most people travel to paintball parks where there are designated areas for play as well as obstacles to hide behind and climb on. This makes it more interesting in the long run. Playing paintball and airsoft war can be a fun time for all. 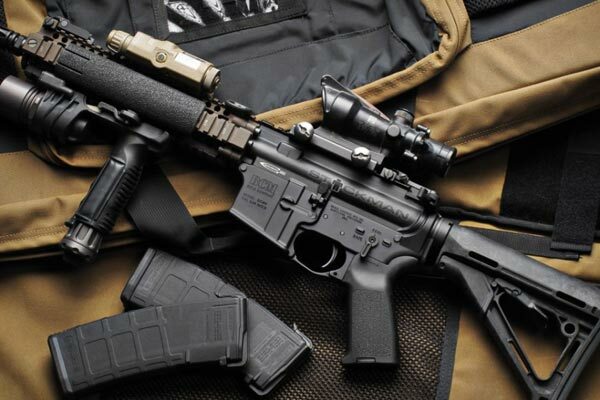 However, before you start playing, there is quite a bit you should know about both types of guns, their ammo, where you should play, and what kind of gear you should wear to protect yourself. 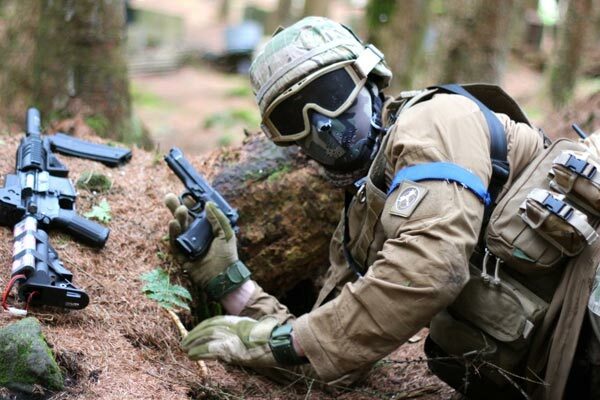 If you are worried about pain, you should note that paintball tends to hurt worse and leave more bruises than airsoft, even though airsoft can leave minor bruises and mild pain if shot within a close distance to the opponent. Keeping a safe distance is always a good idea. Remember, before you play, ensure that you are clothed properly to remain safe, and know everything you can about your gun and safety during these two sports. Having a war with airsoft and paintball guns can be fun, but if you don’t take precaution, you could seriously hurt yourself.